You've (Sometimes) Got to Love Modern Technology! 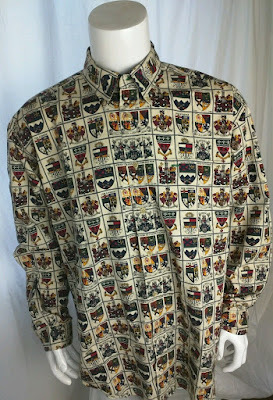 I've been collecting clothing with coats of arms on it -- tshirts, baseball caps, ties -- for quite some time now. And I've shared a number of these items with you over the years. And, of course, I'm always on the lookout for new items to add to these collections. But this latest acquisition is a new one for me; it's a regular, long-sleeved, button-down shirt, not a tshirt. And it's absolutely, literally covered with coats of arms. I'd seen, and purchased, it on-line last week, and it arrived on Saturday. Imagine my happiness at opening the package and unfolding this! I can hardly wait to make an opportunity to wear it. I've got another heraldic shirt purchased and on its way. I'll be sure to share it when it arrives, too.